It's official: Oprah's skipping town and will discontinue her show, a staple in daytime-talk television for the last 24 years. Now that the word is out, and the idea of an Oprah-less television era has sunk into a reality, what are local tweeters thinking? Chicago School Board president Michael Scott was found dead early this morning; police investigating his death believe he shot himself and fell into the Chicago River. The Sun-Times reports the DePaul University senior, Francisco Valencia, 21, of the 5100 block of West Strong Street, died from multiple gun shot wounds where a Halloween party was taking place in the 1700 block of North Rockwell Street on Sunday. Chicagoans at the Bears game against the Browns today saw a tribute to football legend Walter Payton on the 10-year anniversary of his death. Now that the sale of the Chicago Cubs is a done deal, the Ricketts family wants to make itself known to the city, especially to North side baseball fans who've been waiting many years for a step in a more positive direction. Halloween is upon us here in Chicago and nothing gets us in the Halloween spirit like a good old-fashioned scary movie. Liza Whitacre, a 20-year-old barista and Loyola University student, was killed Wednesday in a tragic cycling accident on Chicago's north side. Whitacre was cycling with a roommate on Damen Avenue, when she attempted to pass between a truck and a CTA bus. Whitacre apparently slipped off her bike and fell underneath the passing truck, according to police. According to Chicago Twitterers, the grand opening of Michigan Avenue's Victoria's Secret is the best thing to happen to this city since, well, the grand opening of the Garrett Popcorn flagship store last week. The Chicago Bears have finally found a quarterback who they would like to hang onto, at least for the time being. Last night, Jay Cutler agreed to a two-year contract extension which will keep him in Chicago through the 2013 season. As if the 21-14 loss to the Atlanta Falcons wasn't enough, some Chicago Bears on Twitter became the victim of cyber-bullying yesterday. Harpo Studios announced today that former Alaska Governor Sarah Palin will appear on The Oprah Winfrey Show on Monday, Nov. 16, in what it is dubbing a "world exclusive." StubHub "accidentally" sent automated emails out to thousands of Chicago Cubs and Chicago White Sox fans, as well as those from other teams, stating they can see their team "chase baseball immortality" in the playoffs. One week after the world-renowned Chicago Marathon, three men died at the 32nd annual Detroit Marathon on Sunday due to apparent heartattacks. 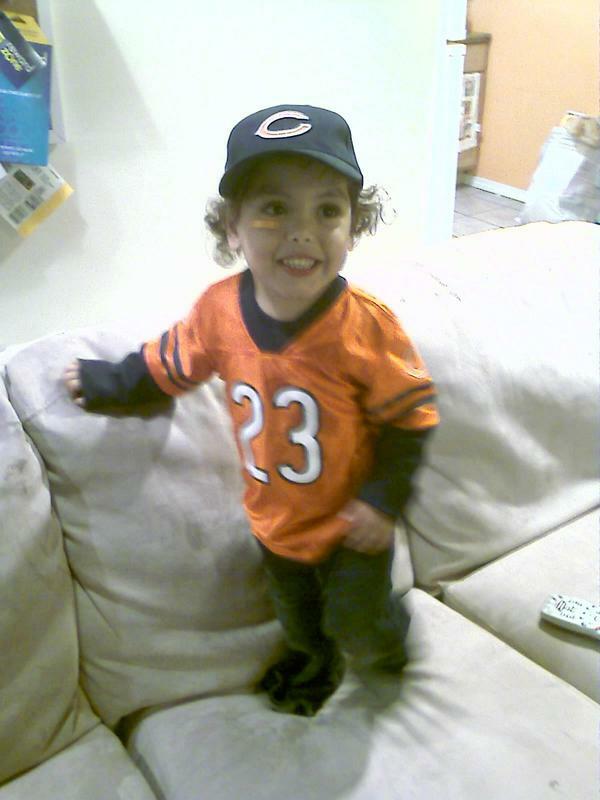 This TwitPic was posted by @826rebel_nalej with the caption, "My lil Bears fan." The now famous story of the "balloon boy", which captivated Colorado, the nation, the world, and even us here at ChicagoNow as we watched the story unfold -- was in fact a hoax, Gawker revealed today. The Regional Transit Authority (RTA), the organization which oversees CTA, Metra and Pace, today recommended to state lawmakers that the "free rides for seniors" program is abolished in light of budget issues. The hottest NFL rumor this morning involves the Chicago Bears and Buffalo Bills wide receiver Terrell Owens. Local Chicago anchor Judy Hsu, who has worked with ABC 7 since 2001, gave birth to a baby boy on the Eisenhower Expressway this morning. Not surprisingly, the news is generating all sorts of buzz today. Columbus Day 2009: What does it mean to you? It's Columbus Day in Chicago. But what does that really mean? Samuel Wanjiru of Kenya won the Bank of America 2009 Chicago Marathon with an impressive 2:05:41, a new course record. It was his first marathon in the United States. On the women's side, Liliya Shobukhova of Russia finished in 2:25:56 to win. Kenya's Samuel Wanjiru won the Bank of America 2009 Chicago Marathon this morning with a course record time of 2:05:41. Russia's Liliya Shobukhova won on the women's side, finishing in 2:25:56. President Barack Obama was awarded the Nobel Peace Prize today, and reaction on Twitter is mixed. UPDATE: As of 2:30 Central Time, Twitter appears to be back to normal. Twitter users are complaining this morning about an apparent glitch on their Twitter home pages. The human brain works in mysterious ways. It's so complex, yet for stimulation, sometimes the simpler the better. Seriously - playing Tetris can improve your intelligence after repeated play, according to a new study, "leading to improved brain efficiency and a thicker cortex." Today marks a new beginning for Chicago and its newspaper business. The Sun- Times Media Group has agreed to a deal with James C. Tyree, CEO of Mesirow Financial Inc. This deal will potentially save the Chicago Sun-Times and several suburban weeklies in the Chicagoland area. Suspicious packages were the cause of evacuation at Bank of America Theater tonight during a run of 'Jersey Boys,' a Broadway in Chicago musical. Co-founder of Twitter Biz Stone (@biz) spoke tonight at Film Row Cinema (Columbia College), 1104 S. Wabash Ave.
As word gets out that 'Little Fockers,' the third installment of the 'Meet the Parents' series, is filming in Chicago this week, tweets are popping up about celeb sightings around town. It's a show that has been talked about for days now, many thanks to Lady Gaga's "s-bomb" and an appearance from Madonna. But the real impact of the latest SNL seems to be a viral video on the Web, depicting President Barack Obama's accomplishments, or lack thereof. Chicago may have lost in the bidding for the 2016 Summer Olympics, but the city has gained some free coffee.